1. Turn oven on to 170C. 2. Grate zucchini and use some of the allocated seasoning, leave for 5-10 minutes. Finely chop mint leaves. 3. Mix all the ingredients for the dip, but discard excess juices from the zucchini. Now the Tzatziki is ready. 4. Mix chia seeds in the warm water and put aside for a few minutes. 5. Mix all the ingredients for crackers except the salt and pepper. 6. Cover a tray with baking paper and spread the dough as thin as possible using a spatula (about 1-2 mm). Then sprinkle the salt and pepper evenly over the whole dough surface. 7. Bake with no fan for 15-20 minutes. Take out and cut or break into different shapes. Yup. This looks amazing! 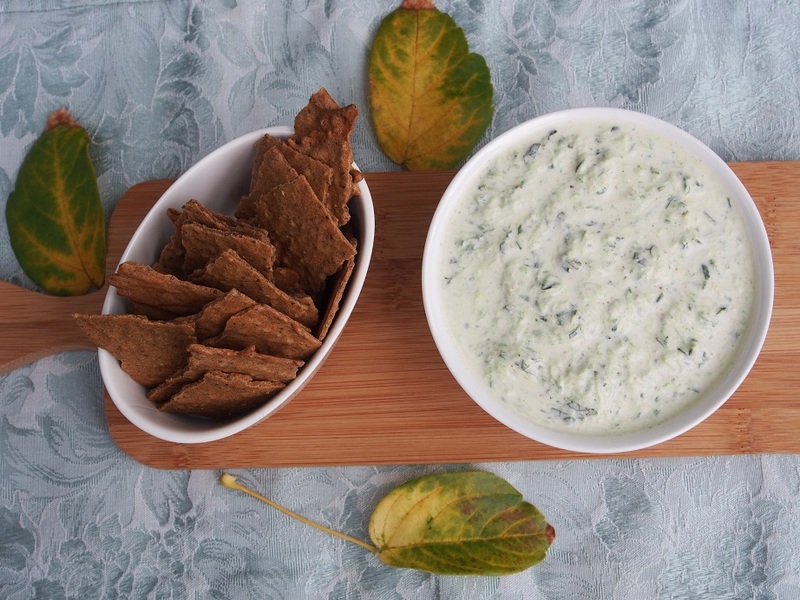 🙂 I’m Greek and have had my share of tzatziki, but I’ve never tried it with teff crackers… which thanks to you, I just found out are gluten free! I rarely can find something to dip with (corn even bugs me! ), so I haven’t been eating all that many dips. Thank you so much for sharing this! !